As one might expect from a biogeochemical technique that often utilizes Bayesian models, stable isotope analysis has a lot of jargon. The basic principles behind stable isotope analysis are quite simple, though. As a predator eats prey, atoms of that prey are incorporated into the predator’s tissues through the process of digestion, which means that on an atomic level, you really are what you eat. Different isotopes (same number of protons, different number of neutrons, so they’re the same element but have a different mass) of certain elements are preferentially retained by certain metabolic processes in a predictable, stepwise pattern. This means that we can detect the diet and habitat usage of animals by comparing their average isotopic ratio (heavy isotope to “normal” isotope) with that of their environment or potential prey. Many tissues have been utilized for stable isotope analysis studies of sharks, but I will be focusing my research mostly on blood, and also will utilize some muscle and fin samples. All of our samples are collected non-lethally. 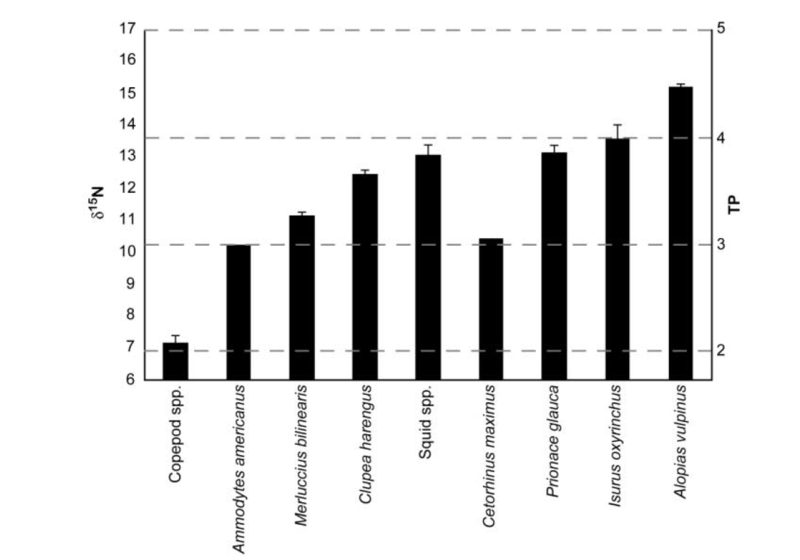 While many stable isotopes exist, the two most commonly utilized for feeding ecology are carbon 13 and nitrogen 15. For more information on stable isotope analysis and how it can be used for shark conservation research (not just the feeding ecology research that I do), please see my 2012 review paper. Here are the research questions I will be asking, and how stable isotope analysis can be used to answer them. 1) What is the trophic position of an animal within a food chain? Nitrogen (N15) ratios move through a food chain in a predicable, stepwise pattern. The rate of increase, which can vary by species and by tissue type, is called the “diet tissue discrimination factor.” If you know the correct diet tissue discrimination factor, you can directly calculate the trophic position, or what step of the food chain a species of interest is. For simple food chains, this can sometimes provide all the feeding ecology information a researcher needs. 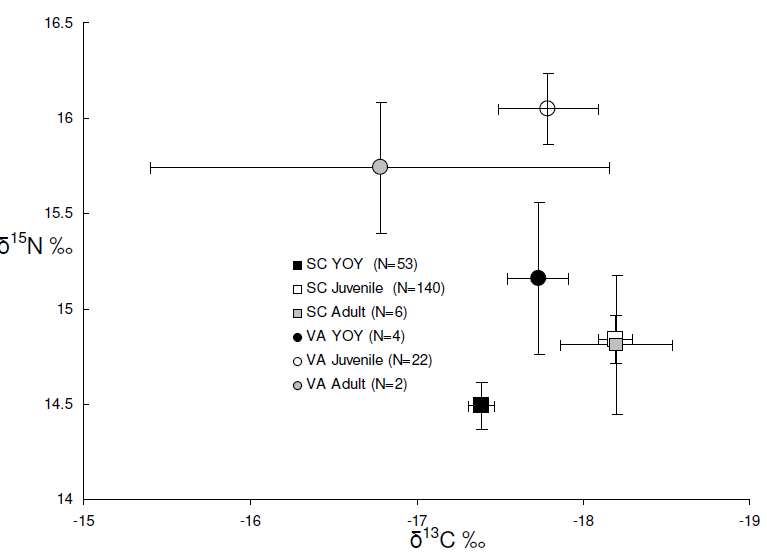 For example, in the figure below from Estrada et al. 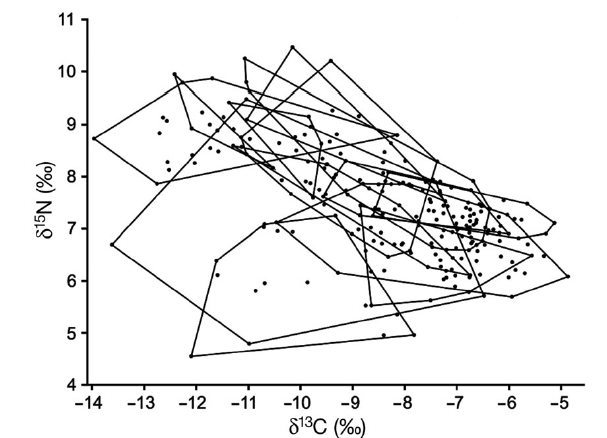 2003 “Predicting trophic position in sharks of the north-west Atlantic Ocean using stable isotope analysis,” you can see that copepods (a zooplankton) are trophic position 2 (right y axis). Cetorhinus maximus, the basking shark, eats primarily copepods in this region, and is trophic position 3, one step higher in the food chain. 2) What does the overall food web in a region look like? While somewhat busy, this figure reveals a general overview of the food web in an estuary. Every point represents the average isotopic signature of a different species. 3) Does the diet of a species change as individuals grow older and larger? Ontogenetic diet shifts in sharks are quite common. Older, larger sharks are able to swim faster and catch different prey (and fit different prey in their mouths) than younger, smaller sharks. There are a variety of ways to detect an ontogenetic diet shift within a population using stable isotopes, including comparing different tissues with different turnover rates (how long it takes for a change in diet to be reflected in isotopic signature) within an individual and comparing the isotopic ratios of growth bands on the vertebrae from different years (like trees, sharks have annual rings, but accessing these requires lethal sampling). One can also sample individuals of different age-classes and compare the average isotopic signature of the different age classes, which is what I did for my Masters research. My figure below shows that adult and juvenile sandbar sharks from South Carolina (SC) have a different average isotopic signature from young-of-year sandbar sharks in South Carolina. 4) How broad is the animal’s diet? and 5) how much does it overlap with over local species? Simple analytical tools exist to measure diet breadth. As a quick visual assessment, simply plot all of the average isotopic ratios of every specimen on the same biplot. Taking up more space on the biplot means that diet is more broad. Additionally, this can reveal diet overlap (i.e. two species sharing similar resources). 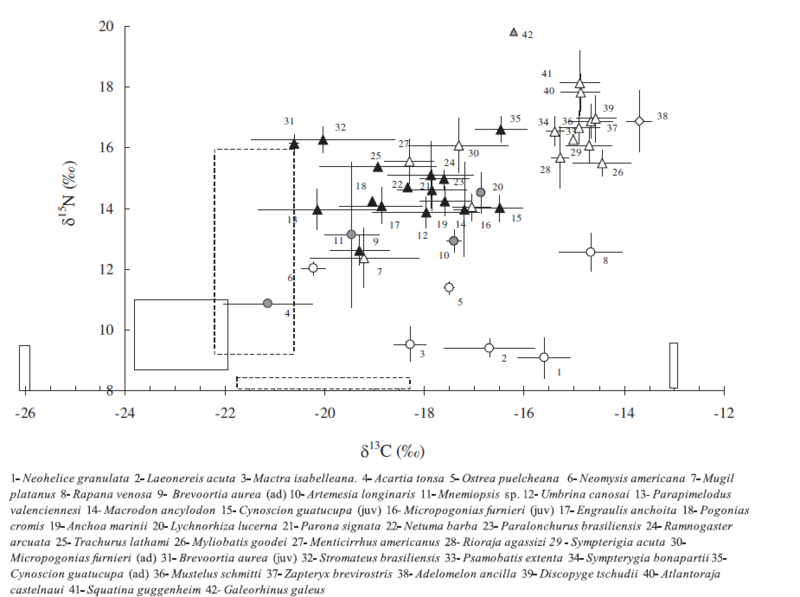 This example from Vaudo and Heithaus 2011 “Dietary niche overlap in a nearshore elasmobranch mesopredator community” shows the relative diet breadth of several coastal shark and rays species, as well as overlap between several of them. Each polygon represents one species. 6) Is there individual diet specialization within a population? Does relatively high diet diversity among a population mean that every individual in the population eats lots of different kinds of prey? Not necessarily. It may mean that there are different kinds of dietary specialists within the population. Stable isotope analysis can help answer this question. Matich et al. 2011 ” Contrasting patterns of individual specialization and trophic coupling in two marine apex predators” found that certain individual tiger shark’s isotopic values changed over time, but individual bull sharks remained consistent (but different from other individual bull sharks). This suggests that tiger sharks are truly generalists, but there may be individual specialist bull sharks. 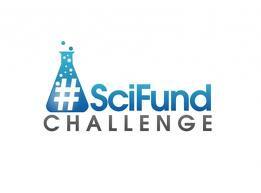 Stable isotope analysis is a robust and powerful tool with many applications, and with your help in the SciFund challenge, I’ll be able to use this technique to help generate data that natural resources managers need to better conserve and protect coastal shark species in south Florida! Please let me know if you have any questions about the project, or about stable isotope analysis.